It took me a little bit of time to figure out the Blessed Virgin was the “missing link’ when it came to my spiritual life. In fact, this link is what is missing for many a Christian who is outside the fold, especially Protestants. Some Catholics believe that Protestants have a hatred for our Lady, but that’s not so at all. Protestants believe that May was blessed indeed to have been chosen as the “vessel” to bear our Lord. They believe she is either in heaven or awaiting the final judgment like all the Saints. There is no doubt in a Protestant’s mind that Mary is “saved”. So we can’t call that a hatred of the Virgin. What they do hate are statues of Mary or anything that looks like worship of Mary. This comes from a good place. When Protestants ponder converting, they become petrified of committing idolatry by “worshipping” Mary. They don’t understand the difference between Latria, which is a reverence directed only to the Trinity, dulia (veneration of Saints) and hyperdulia (the type of veneration relegated to Mary). So when I first entered the Church, even though I understood the concepts, I was not completely at ease and it took me a little while to pray for her intercession. However, when I did, I grew to understand that it was a sure path to sainthood. If you’re harboring resentment towards your mother, which can impede your spiritual growth, you can work out all your issues in therapy or you can cultivate a relationship with your earthly mother. 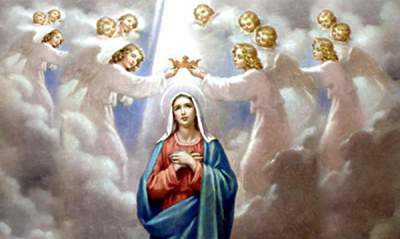 Our heavenly Mother will never fail us. Mary is the spiritual mother of all mankind. When Jesus was on the cross, he said to his mother, “Woman, behold your son” and he said to John, “Behold your mother” (John 19:26-27). The Church has always taught this to mean that that passage signifies that Mary’s role from henceforth was as mother of all. I’m not someone who ever felt like I couldn’t approach our Lord, due to my Protestant upbringing, but I know it is a real problem for some. You can’t go wrong going to Mary because all she will say is “Do whatever she tells you”. This brings up the concept of “To Jesus through Mary”. Devotion to Mary leads directly to the heart of Jesus. Talk about networking! If we love Mary then we should make a concerted effort to imitate her holy virtues. Women especially, can learn to imitate the virtues of Mary, as we are bombarded daily with feminist propaganda. Sometimes we don’t know what true femininity looks like. As it pertains to men, a man who loves his Mother, will never be a man who abuses a woman. We have recourse to the Blessed Virgin when it comes to the sins that are most likely to send us to hell. I’m speaking of sins of impurity. Our Lady of Guadalupe said to Juan Diego, “Are you not under the mantle of my protection”? When we are tempted with sins of impurity, we can hide like little children under the Blessed Virgin’s Mantle. “Yes, Mary is aflame; the Catechism tells us she is the burning bush (Ex 3:2), radiating fire without being consumed (CCC 724). But hers is a purifying fire—purifying us so that she might draw us ever closer to herself, under the loving protection of her mantle. She does this always out of love, not out of a desire to judge us or humiliate us. You can see this love in Our Lady of Grace’s hands. She does not hold them up like a traffic cop, to push us away. Her palms are always open, inviting us near. Through drawing us with maternal care into her own love, she enables us to grow in that same Holy Spirit love—the love that will draw us closer to one another and to God.” [note]My Peace I Give You: Healing Sexual Wounds with the Help of the Saints, by Dawn Eden, from Ave Maria Press. All rights reserved. [/note] Originally excerpted from My Peace I Give You: Healing Sexual Wounds with the Help of the Saints, on Patheos.com. “Turn, then, O most gracious Advocate, thine eyes of mercy toward us, and after this, our exile, show unto us the blessed fruit of thy womb, Jesus. O clement, O loving, O sweet Virgin Mary.” From the Hail Holy Queen. “Pray for us sinners, now and at the hour of our death”. The Hail Mary. “Whoever Dies Piously Wearing This Scapular, Shall Not Suffer Eternal Flames”. Our Lady of Mount Carmel. There are many more, but what a consolation it is to know that our Mother will intercede for us fiercely at the hour of our death. The Blessed Virgin is indeed the missing link, not just for Protestants, but for those who want to reach greater spiritual heights and a greater understanding of our Lord.